Published By – Longitude Music Co. Published By – Nickelshoe Music Co. Published By – Brookside Music Corp. Published By – Unidisc Music Inc. Published By – Famously Unknown Music, Inc. Published By – WEP Music Corp. Produced For – Bad Boy Entertainment, Inc. Produced For – Top Of New York, Inc. Produced For – The Mystery System, Inc. 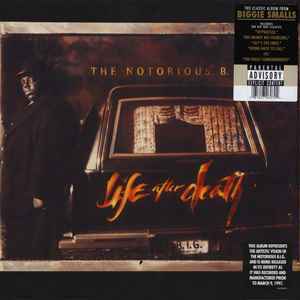 Produced For – Works Of Mart Productions, Inc.
"This album represents the artistic vision of The Notorious B.I.G. and is being released in its entirety as it was recorded and manufactured prior to March 9, 1997." Executive Producer: Sean "Puffy" Combs for Bad Boy Entertainment, Inc. Associate Executive Producer: Mark Pitts for Bystorm Entertainment. ℗ & © 1997 Bad Boy Records. Marketed by Rhino Entertainment Company, a Warner Music Group Company. Printed innersleeve says "Manufactuted & Marketed by Rhino Entertainment Company"
Produced for Top Of New York Inc./Bad Boy Entertainment, Inc.
Strings arranged for Bad Boy Entertainment, Inc. Contains samples from "In The Rain", performed by The Dramatics. Courtesy of Fantasy Inc. Produced for The Mystery System, Inc. Produced for Works Of Mart Productions, Inc. Produced for Bad Boy Entertainment, Inc. Produced for Mobb Deep, Inc. Co-Produced for Bad Boy Entertainment, Inc. Contains samples from "I Love You More," performed by Rene & Angela, courtesy of EMI Recordings Group. Used by permission. All rights reserved. Angela Winbush appears courtesy of Island Records, Inc. Produced for The Mystery System, Inc./Bad Boy Entertainment Inc. Contains samples of "PSK (What Does it Mean)," written by Weaver, Jr., published by Zomba Enterprises Inc. (ASCAP), performed by Skooly D. Courtesy od Jive Records. Used by permission. All rights reserved. Produced for Top Of New York, Inc./Bad Boy Entertainment, Inc. Produced for Illtown Records Ltd. Produced for Works Of Mart, Inc. Published byAmani Music (ASCAP)/Nickelshoe Music Co., Inc., adm. by Ocean Drive Music (BMI), a division of Brookside Music Corp. Contains interpolations of "Hey Love" (W. Hart), Nickelshoe Music Co., adm. by Ocean Drive Music (BMI), a division of Brookside Music Corp. Published by Clark's True Funk Music, Longitude Music (BMI)/Blue Image Music (PRO), Zella Music (BMI), both division of Unidisc Music Inc. Contains a sample from "My Flame," written by Bobby Caldwell, published by The Music Force, Lindseyanne Music Inc., Longitude Music Co. (BMI). Performed by Bobby Caldwell, courtesy of Sin-Drome Records, Ltd. Produced for The Mystery System, Inc./Bad Boy Entertainment, Inc. Contains sample of "Spacewalk," written by Kit Walker, publised by Wind Tiger Music (BMI). Used by permission. All right reserved. Produced forTop Of New York/Bad Boy Entertainment, Inc.
DMC appears courtesy of Profile Records, Inc.
All Instruments for Bad Boy Entertainment, Inc.
A great pressing with a full sound and no skipping issues.